Taking your brand online is passe; what's pivotal today is going e-global. For existing players, the game is easier as they have already tasted the waters and would have a greater edge as compared to the new players. Daily hassles as well as transaction related issues would not be new to them. Conversely, there can be some obstructions for existing players as well in terms of constrained technological processes. Sirdeshmukh says, “The game can be dicey for existing players in terms of constraints in processes built for domestic operations, which might not align internationally. On the other hand, new players can wire their back end accordingly. Nonetheless, existing players have hands-on experience of execution, which can prove valuable.” Adding to the same, Lal says, "The acceptance of the brand becomes higher with an international recognition and with people having some awareness about the brand." Trade barriers, country exclusive restrictions, forbidden goods, customs concerns, etc are some key issues that will come in your pathway to growth. Sirdeshmukh adds, “There can be a serious hassle pertaining to infringement of brands, especially for a multi brand e-retailer, wherein he may not have the right to sell a particular brand at some international location as someone else may have the selling rights.” These are little hiccups that can be dealt with and, in return, will give you a better understanding of the trade. Convenience is what customers look for while shopping online. For overseas customers, the website should be made available in local languages. The biggest roadblock that can spoil the shopping experience for a customer is currency conversion for the price of a product, so make sure to either have a currency converter or have precise pricing for every country. The collection available online should also cater to a global audience to drive sales because that will be a booster for sales once a customer lands on a website. Pricing will be a serious concern for customers overseas. The price for a product will shoot up once it crosses the Indian borders and makes way into another country. Shipping costs, import and export duties all add up to the price tag amplifying the cost in some cases to over 200 per cent of the original price. For some, it may not be a concern as the same product may cost about as much in their currency. 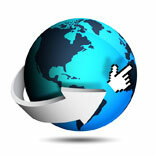 Going e-global can give your brand greater visibility and recognition. Taking brick and mortar stores to foreign locations demands greater efforts than taking it global in the virtual world. If done right keeping in mind all the potholes, it can work wonders for your business, thus helping you pocket greater revenues.